A former electronics and computer engineer, Jon took a break from the corporate world after sailing the 2003 Transpac (Los Angeles to Honolulu) yacht race. That fall he joined San Diego Mineral & Gem Society and took a lapidary class where he learned to cut and polish cabochons (rounded stones). The instructor noticed he was good with his hands and had an eye for detail. The instructor, silversmith Oscar Lopez, invited him to attend a private silversmithing class with two other students. Jon continued taking silver classes through the Craft Center at UC San Diego. These classes included silver fabrication, stone setting, and casting. He later reinforced his knowledge as a teaching assistant. 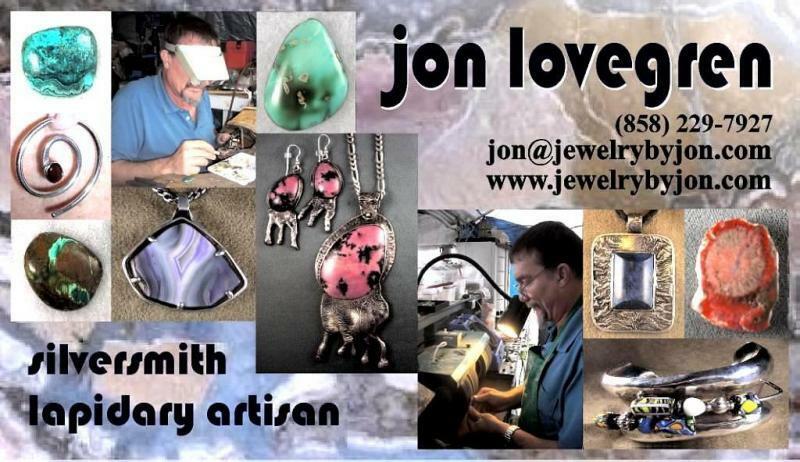 Jon started producing work for sale in 2008 from his home studio and lapidary workshop. His goal is to develop his art into a second career that pays the bills. In 2009, he was juried into the San Dieguito Art Guild and sells in their Off Track Gallery in Encinitas, CA. Jon is also a member of the San Diego County Art Association and sells at their twice-monthly shows in San Diego's Balboa Park. In 2012, he was accepted into San Diego's Spanish Villiage Art Center, also in Balboa Park, and regularly sells on their patio. He is a member of the San Diego Mineral and Gem Society. His first competitive award in a professional category was received in 2012. He frequenly participates in art and fine craft shows throughout the Southwest. Most weekends you will find his booth at one of the Balboa Park locations. Jon setup his booth, often daily, for 77 sales days in 2012. He holds both a BS and MS in electrical engineering. He has been a part-time faculty member at San Diego State Univ. Jon lives in San Diego, CA with his wife Betty. Besides making and selling jewelry, or digging for turquoise, his favorite activity is hanging with his grandchildren, Devin and Ava, both age 5.